"Cav's betrayed heroine Santuzza was performed by the sensational Eugenie Grunewald, who could be the new generation's mezzo-soprano of one's dreams. Her magnificent, expressive voice cuts right through to the heart of the listener, while it cocoons the ears in gorgeous sound. " 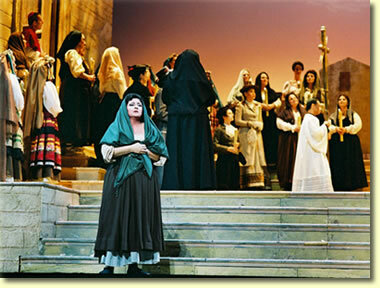 ".....a compelling singer, the huge-voiced dramatic Mezzo-Soprano Eugenie Grunewald portrayed the desperate Santuzza." "Vocally, the evening belonged to the magnificent Santuzza of Eugenie Grunewald, intense, huge-voiced and comfortable with the kind of elemental verbal expression that this mini-marathon of a part demands. Thank goodness (in this age of Lyric Didons and Amnerises) that someone is willing and able to go the distance and perform Santuzza on this scale. "Eugenie Grunewald was exceptional as the wounded Santuzza"
As Santuzza in Cavalleria Rusticana "Mezzo-Soprano Eugenie Grunewald soared on a high-gloss, richly colored instrument as the dishonored Santuzza ..."
"Eugenie Grunewald was a complete knockout as the wounded, vengeful Santuzza� Her singing was a gorgeous, tragic wail." 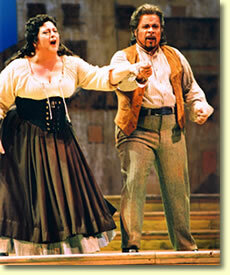 "First and foremost is Grunewald, who owned the stage the second she opened her mouth to sing. She possesses an incredibly powerful voice, but one that never loses it's delicacy and flexibility for the sake of volume, qualities ably demonstrated in the aria "Voi lo sapete" and in the high-intensity duets with the tenor and baritone ." 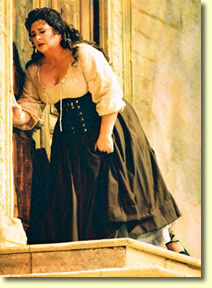 "Eugenie Grunewald showed admirable work as the passionate Santuzza"